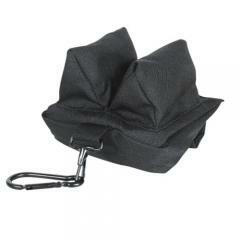 Designed by a sniper, the compact and functional Sniper Bean Bag is a simple but effective solution for accurate long-range shooting on unstable terrain. The V-shaped design cradles the fore stock or muzzle of firearms for enhanced stability while the soft base allows it to sit securely on rough ground. A hook-and-loop opening on one side allows for the addition or removal of filling to achieve desired firmness. Convenient hands-free carry is possible with the sturdy, sewn loop on the Bean Bag that makes it easy to attach it to a pack, belt or vest using a cord or a carabiner.